A Mourning Warbler sang on the south side of Lord Stirling Road this morning, just east of the main entrance of Lord Stirling Park (Jeff Ellerbusch). Other species observed include Yellow-billed and Black-billed Cuckoos, White-eyed Vireos, Marsh Wrens, Swainson’s Thrushes, 13 warbler species, such as Magnolia, Blackburnian, Blackpoll, Black-throated Blue, Canada, etc. Several observers report the continuing Yellow-breasted Chat near Bullfrog Pond. 2 White-eyed Vireos were in the Great Swamp this morning. Both were on Pleasant Plains Road – one north of White Bridge Road and the other south. It was mesmerizing at 8:10 PM this evening, as a single group of 250 Chimney Swifts flew in circles and twittered over the St. Peters Episcopal Church complex in Morristown. 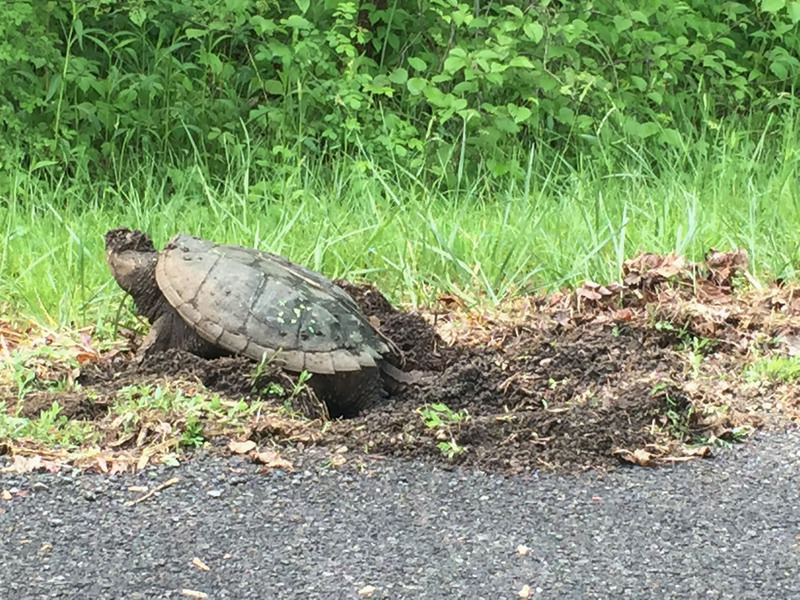 The photo below, taken yesterday, is of a Snapping Turtle busy at work in the Great Swamp NWR. One wishes she chose a nest site further from the road. This entry was posted in Morris County, Somerset County and tagged birding, birds, migration, mocosocobirds, Morris County, nature, ornithology, Snapping Turtle, somerset county. Bookmark the permalink.